This delightful folk tale is taken from Mexican-American Folklore: Legends, Songs, Festivals, Proverbs, Crafts, Tales of Saints, of Revolutionaries, and More, by John O. 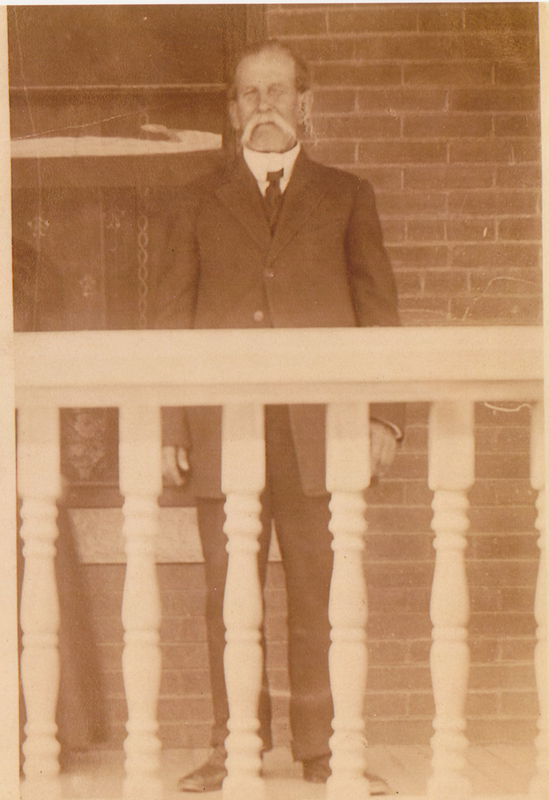 West (August House, Little Rock, 1988), and concerns my great-great-granduncle José Mauro Luján of San Elizario. 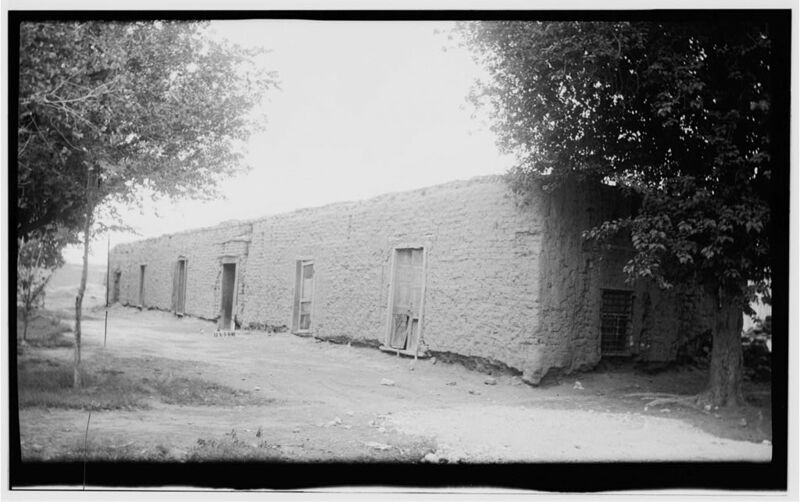 His father, Don Jesús Luján (~1813-1871), built an adobe house just off the Plaza in San Elizario where the family lived and operated a dry-goods business. José Mauro and the house figure prominently in the popular El Paso uprising known as the Salt Wars, as does his mother, my great-great-great-grandmother Doña Apolonia (Trujillo) Luján (~1819-1877). 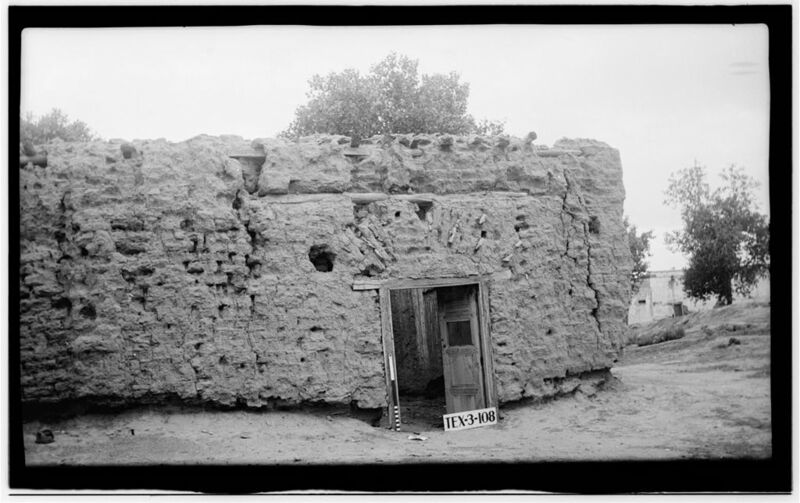 The ruins of the house, built around 1850, were documented in photos taken for a 1936 WPA survey of historic buildings of El Paso. Near the church in San Elizario is an old, rambling adobe house of many rooms. It was once a mansion, the property of a famous local character named Mauro Luján. Years ago this house was the scene of many a gathering of plotting politicians. During the Salt War of 1877, the bloodiest affair in Valley history, Don Mauro’s house is said to have been headquarters for the leaders of the mob. Since the old man’s death, it has gone to ruin. 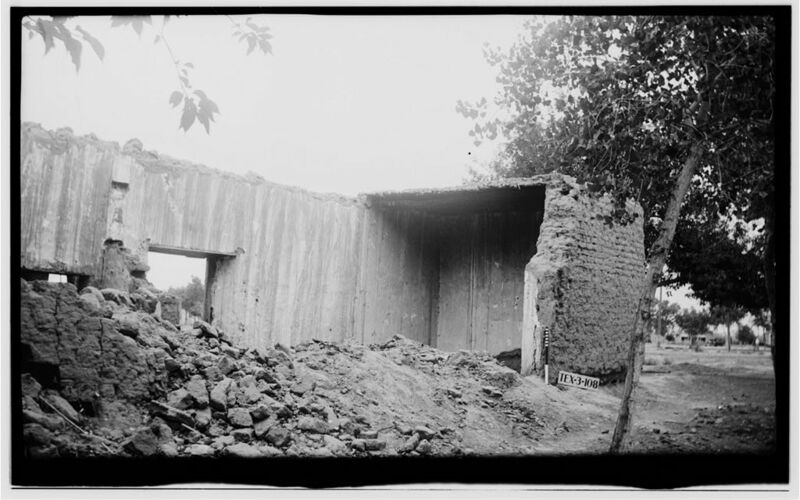 No whitewash has touched its walls in years, and no one has bothered to repair the places where the adobe has crumbled. Still, Don Mauro must love it, for he has often been seen wandering from room to room saying his rosary. Many people have lived in his house. To one pair of tenants, María de Ramírez and her husband Alejo, he revealed the location of a pot of money with which they were to have masses said for his soul. They, however, were unfaithful to the trust. They took the money across the river to Mexico, where they set themselves up in the grocery business. They did not prosper, however, and María soon died, as one would expect. Then an elderly pair named Maciel moved in, to whom Don Mauro was only a name. Antonio worked until late at night, leaving Bonifacia to go to bed by herself. At last the old lady went to her friend Doña Tomasa Girón and told her a strange tale. “Y todavía es,” said Bonifacia de Maciel, looking very wise. “Y todavía es. Me hace cariños.” (He still is; he caresses me). And just for the record, a census of the valley for 1841 lists one Mauro Luján, then two years old, living in San Elizario, so he did at least exist once. Don José Mauro Luján is the brother of my great-great-grandfather Juan María Luján. According to legend…. The Lujan Hacienda was was visited around midnight in late November, 1876, by two men in need of rest for themselves and their horses, Juan Lujan allowed the use of the barn. A few hours later the two men broke out Melquiades Segura from the Old County Jail around the corner and rode away in the darkness. The men: William Bonney and Tom Foliard. I also am a Lujan My Great Great Grandfather was Juan Mauro Lujan. I have many pictures from that time as well as letters that were left to me from my grandfather Raymond Lujan. I would love to share. Also in the museum in San Elizario there is a picture of the piano we still have to this day! “Along with this powerful padre a good many prominent Mexican – Americans were associated with Mills and his organization. Among them was J. Lujan – Don Mauro – who lived in big adobe house near the church in San Elizario, the county seat. His fellow townsman Telesforo Montes, a famous Ranger and Indian fighter, was another, as were Maximo Aranda, judge, legislator, collector of customs, businessman, and Gregorio Garcia, justice of the peace. Martin and Benigno Alderete of Ysleta, leaders of a prosperous and prominent clan, belonged to the group. In fact, almost everybody who was anybody was on the side of the Mills – Fountain – Borrajo faction.” Excerpt from “Pass of the North” Volume 1 – 1529 – 1917, Four Centuries on the Rio Grande by C. L. Sonnichsen. I have fond memories of going to the Lujan’s house during the 60’s/70’s. Mr. & Mrs. Lujan were good friends of my parents. they had many dances and meals in this home. Unfortunately, we always referred to them as Mr. & Mrs. so I don’t know their 1st names. They had a daughter that would be about 60 something by now. Would love to reconnect with the family! I am a descendant of Apolonia Lujan Trujillo Born 1812 – 1877 San Elizario , El Paso, Texas.